The Kremlin has dismissed as "sheer nonsense" claims it was involved in the poisoning by thallium of a former KGB colonel living in the UK. Alexander Litvinenko, 43, has been moved to intensive care at UCH hospital after a deterioration in his condition. The critic of Russian President Vladimir Putin fell ill on 1 November after a meeting at a London sushi bar. His condition remains serious but stable. Met Police anti-terrorist officers are leading the investigation. Friends of Mr Litvinenko have alleged he was poisoned because he was critical of the Russian government. Kremlin spokesman Dmitry Peskov said: "We cannot comment on the very fact of what happened to Litvinenko. "We don't consider it possible to comment on the statements accusing the Kremlin because it is nothing but sheer nonsense." Russia's foreign intelligence service has also issued a statement denying any involvement. Mr Litvinenko had been investigating the murder of Russian journalist Anna Politkovskaya, an outspoken critic of Mr Putin and Russian policy in Chechnya, who was shot dead at her Moscow apartment building last month. Alex Goldfarb, who has been visiting Mr Litvinenko in hospital and who has alleged Russian government involvement, admitted there was "no direct evidence" of that. He told BBC Radio 4's Today programme: "He actually had a couple of meetings [on 1 November] where he had drinks and this poison could be sprinkled there." Doctors had told Mr Litvinenko he had a 50/50 chance of surviving the next three to four weeks, Mr Goldfarb added. On Monday, it emerged that a petrol bomb had been thrown at Mr Litvinenko's London house in October 2004, exploding and damaging the front of the property. Meanwhile, Scotland Yard said on Monday afternoon it was treating Mr Litvinenko's illness as a suspected "deliberate poisoning". Officers were making "extensive inquiries" in their investigations including interviewing possible witnesses, including Mr Litvinenko, and examining CCTV footage, it said in a statement. "We await the results of the toxicology tests and we are therefore not speculating as to the possible cause of his condition at this stage," the statement added. It is thought results of the tests would be available in days rather than weeks. 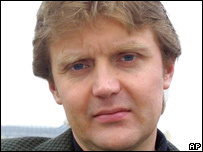 Speaking to the BBC last week about his investigation into the murder of Ms Politkovskaya, Mr Litvinenko said a contact had approached him to say they should talk, and they arranged to meet at a restaurant in Piccadilly on 1 November. "He gave me some papers which contained some names - perhaps names of those who may have been involved in the murder of Anna Politkovskaya - and several hours after the meeting I started to feel sick," he said. 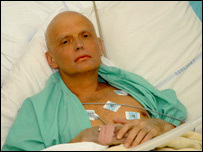 Two weeks later Mr Litvinenko was taken seriously ill and admitted to hospital. Clinical toxicologist John Henry said Mr Litvinenko was "quite seriously sick" and there was "no doubt" he had been poisoned by a potentially lethal dose of thallium, probably on 1 November. "It is tasteless, colourless, odourless. It takes about a gram - you know, a large pinch of salt like in your food - to kill you," he said. BBC security correspondent Gordon Corera says while there is no confirmed link to the poisoning, the Russian secret service has been accused in the past of carrying out operations against dissidents in a number of countries. 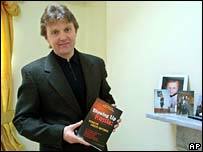 In a book, Blowing up Russia: Terror from Within, Mr Litvinenko alleged that agents of the KGB's successor, the Federal Security Service (FSB), co-ordinated the 1999 apartment block bombings in Russia that killed more than 300 people. Russian officials blamed the explosions on Chechen separatists and in that year the Kremlin launched a new military offensive on Chechnya.